Welcome to One Stop Lube in Thunder Bay, ON. We are your locally owned and operated professional 10 minute oil change experts. We have been proudly serving Thunder Bay for 20 years. Built around the pit method of working on your vehicle, you are able to drive up, drive in and drive through in 10 minutes or less. As soon as you drive your vehicle into our pit area, our service professionals are there immediately to change your oil. We do not waste any time by using any sort of hoist or lift and only offer you what you need to achieve the best performance from your vehicle. Change your oil every 3 months or 5,000 km (which ever comes first). Change your air filter twice per year (every 6 months) *change more often if you drive on a lot of dusty roads. Our VIP Maintenance Program provides great savings on all of Brian's recommendations! To enjoy instant savings on your next oil change, click here. For long term savings in vehicle maintenance, join our VIP Maintenance Program! Need more than just an oil change? Click here for One Stop Auto - Complete Car Care. 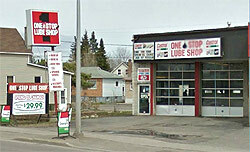 © 2009 One Stop Lube / One Stop Auto; All Rights Reserved.